Leading Indicators in translation | Language Solutions Inc.
Edited version from our Metrics for Multilingual Communications Blog: Too much focus on lagging measures. 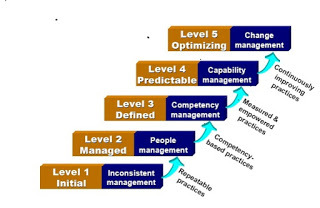 A number of factors affect an organization’s position on the Global Communication Maturity Model 2.0™ (GCMM). In organizations that are just beginning to respond to international marketing demands, process management efficiencies are usually driven at the operational level. Upper management in organizations at the Reactive and Conscious levels rarely drive process management initiatives. As companies mature, the strategic top is increasingly involved in and focused on process management because their global communication endeavors have a bigger impact on the overall success of the company. The position that an organization is in on the GCMM is indeed a lagging indicator. Too many organizations focus on the lagging measures such as profit, ROI, etc. Those are the existing metrics currently in our industry. Metrics are critical to global thinking, but failing to measure the right things can lead one off the path. Language Service providers in our industry have plenty of metrics, especially TM (Translation Memory) leverage percentages. However, global organizations need to look at the leading indicators that influence and forecast the amount of leverage an organization can get from their TM. Those leading indicators need to be aligned with the people in the organization that impact those measures. At Language Solutions, we help organizations to tie key objectives to people and processes within their organization, providing insight on accountability and decision support. How do you get to leading indicators? We’ve put already a lot of hours in our model to uncover leading indicators from our industry perspective. However, every organization will have its own challenges and opportunities and relationships that define what leading indicators are applicable to their situation. One simple method for finding out leading indicators is the 5 Whys. This a tried method in Six Sigma methodology and a very effective method to start finding the root cause. 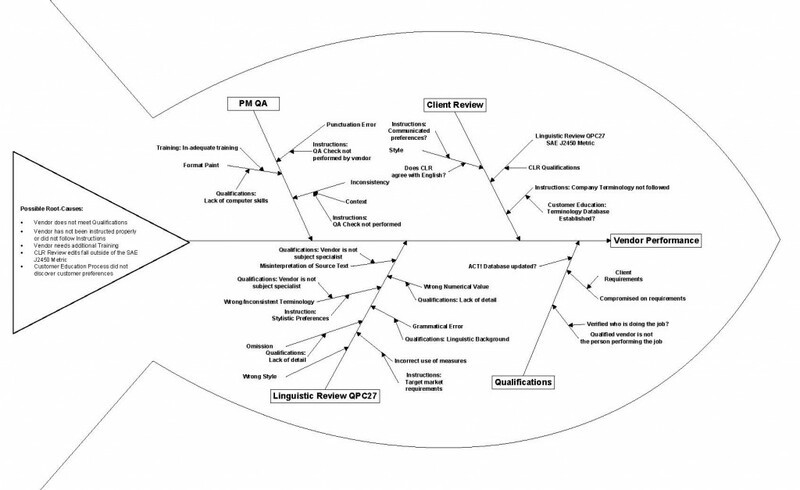 One other method we apply is the fish-bone diagram to find relationships between root causes specific to one problem. While these methods are helpful, it takes time to get into the mindset of leading indicators. We find that it’s mostly a cultural shift from thinking about symptoms to thinking about the core root cause.